I completed my MSc in Primate Conservation with Distinction (highest honors) in 2015 and have been accepted into the PhD program at Oxford Brookes University. I will conduct this long-term research focusing on the behavior and ecology of nocturnal African lorisiforms for my PhD thesis. I conducted my master’s research on East African pottos (Perodicticus ibeanus) and two species of galagos in Kibale National Park Uganda. I have recently completed a 2-month pilot study on pottos and angwantibos in Cameroon. I have experience with both botanical data collection and survey techniques. I am also experienced with the nocturnal primate surveying, protocol, and behavioral data collection methods that will be used in this study. I will also be working with my academic supervisor, Dr. Anna Nekaris. Dr. Nekaris has conducted primate research in Asia since 1996, conducting long-term surveys, taxonomic identification, conservation assessment and behavioural observations with radio tracking of wild slow and slender lorises. 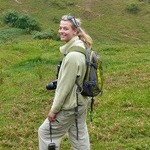 She subsequently founded the Little Fireface Project, a major loris conservation initiative. She first encountered wild pottos and galagos in 1994 in Senegal, and conducted surveys of East African pottos and galagos in Kibale National Park, Uganda and East African pottos in Kakamega National Park in Kenya. She is experienced in the methods to be employed in this study, and has also extensively examined potto and angwantibo museum specimens to be in a position to confirm the species present in Korup. She is the course tutor of a course in primate conservation at Oxford Brookes, where approximately 20 students per year come to learn major aspects related to conservation including biogeography, human wildlife conflict, genetics, methods, captive management, and education. Watch me speak about nocturnal primate research and conservation at the Blank Park Zoo in my hometown of Des Moines, Iowa! Thank you Stephen! We're getting there! Hi Cindy! Good question. We are not actually testing their vision in the same way an optometrist tests yours. We are actually more interested in if the angwantibo uses mostly vision or scent to catch prey. In a way, it does mean we need to know how well it can see. But behavioural observations help us answer these questions. If an angwantibo is often able to detect insects that are well-camouflaged and unmoving, this suggests vision is important. If an angwantibo can catch insects out of the air, this could suggest vision is important as well- though this could also suggest hearing is important! It is a bit complex to tease out. Charles-Dominique suggested angwantibos have poor vision after watching them navigate through branches or after watching them react to human presence. Honestly, his inference seems full of assumptions, but we don't have much else to go off of! Once we can see what the angwantibo is eating and navigating, we can start to make inferences about vision based on food characteristics/ how the food is obtained as well as the routes the animals take in the habitat. Basically, it isn't easy, it just takes a lot of careful observation!